This is a list of races in or near London. Please email us if we've missed a race or need to update any details below. Happy racing! 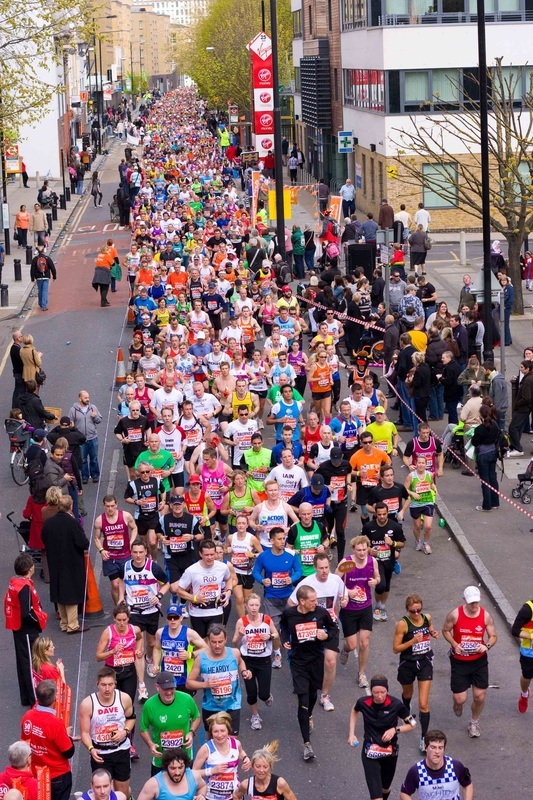 London Marathon | Chris Brasher dubbed this iconic marathon the “the great suburban Everest”. But the down side of its global prestige is that it’s also hard to get in to. Charity spots are usually your best bet, however, if you have some wheels you can improve your chances by applying under the good-for-age category (with proof of a recent marathon time) or, if you are registered to a UK club, through the championship category (sub-2:45 for men and sub-3:15 for women). Late April. 38,000 entries. Richmond Park Marathon | Low-key marathon in beautiful surrounds. May. 400 entries. Thames Meander Marathon | Flat out and back marathon (with half option) starting and finishing in Kingston. Early Nov, 400 marathon entries. Heartbreaker Marathon | Mostly off-road race through the stunning New Forest, 90 minutes southwest of London (with half marathon option). Late February. 300 entries. Greensand Marathon | Surrey hills trail marathon starting and finishing in Dorking, just southwest of London. Half marathon option. Oct, 200 entries total. Steyning Stinger Marathon | A hilly cross-country race through the South Downs between Worthing and Shoreham-by-Sea (with half marathon option). 90mins south of London. Early March. 200 entries total. Sussex Coastal Marathon | A hilly are along the Sussex coastal path from Birling Gap (two hours south of London). Half, 10k and ultra distances available (organised by Endurance Life). Late April. 1000 entries total. Brighton Marathon | Two hours south of London and a great second option if you miss the London Marathon. It also includes a kids’ mile race. Mid April. 10,000 entries. Shakespeare Marathon | Taking in the sights and surrounds of Stratford-upon-Avon two hours northwest of London. Includes half marathon option. Late April. 3000 entries total. Three Forts Challenge | One more mile than your standard marathon, plus plenty of hills in Steyning (90 mins south of London). Half marathon option. Early May. 400 marathon entries. Sussex Marathon | Another London Marathon alternative in rural Heathfield (90mins southeast of London). April. 400 entires total. Milton Keynes Marathon | 90 minutes northwest of central London, with half marathon option. Early May. 2500 marathon entries. Halstead & Essex Marathon | 90 minutes northeast of central London. Mid May. 500 marathon entries. Kent Roadrunner Marathon | Just east of London at Gravesend, held on a traffic-free road circuit designed specifically for cycling and running races. Late May/early June. 450 entries (limited). Cheltenham Challenge | Hilly, mixed-terrain, but scenic marathon with 5k, 10k, half and ultra options. Cheltenham (two hours northwest of London). Late June. 200 marathon entries. South Downs Trail Marathon | A summer trail marathon with half and relay options at Petersfield (90mins south of London). Late June. Bacchus Marathon | An undulating course with mid-race wine tasting and fancy dress encouraged. Half marathon and 2.5k options. Dorking (one hour southwest of central London). Mid September. 200 marathon entries. Farnham Pilgrim Marathon | A hilly, mostly off road race one hour southwest of central London (with half marathon option). Late September. 1000 entries total. Bournemouth Marathon Festival | Two hours southwest of London, the marathon is coupled with a weekend of running (including a half, 10k, 5k and junior races). Early October. Over 2000 entries total. Clarendon Way Marathon | Hilly point-to-point marathon through Wiltshire and Hampshire countryside (with half and relay options). Early October. 1000 entires total. Leicester Marathon | Two hours northwest of London. Includes a half marathon as well. Late October. 5000 entries total. Abingdon Marathon | Just south of Oxford (80mins west of London). Late October. 800 entries. Broadway Marathon | A hilly multi-terrain marathon through the scenic northern Cotswolds (two hours northwest of London), with half marathon option. Mid November. Entries limited to 130 in each event. Virgin Money London Marathon in full swing (plenty to run with around the 4-hour pace mark!). Probably seemed like a great idea four months ago. 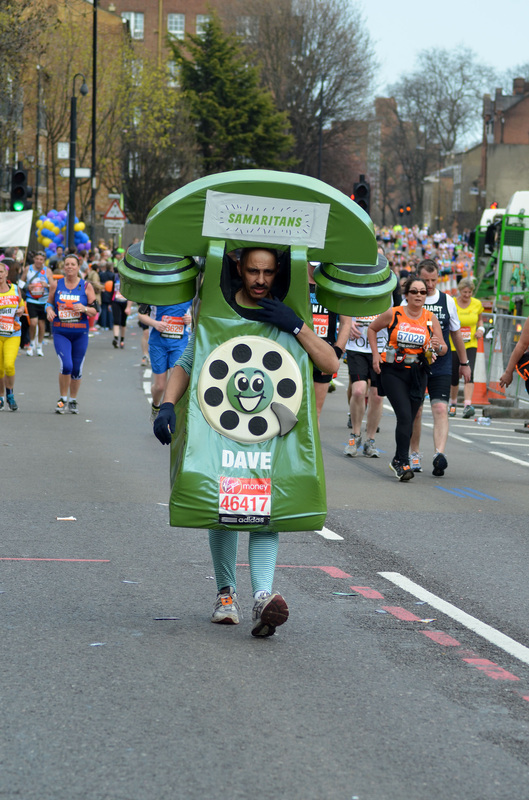 Got to hope the Samaritans raised HEAPS! Royal Parks Half Marathon | “London’s most beautiful city run” held in the inner-city Royal Parks. October (ballot opens in January). 12,500 entries. East London Half Marathon | Starts and finishes in West Ham Park in Stratford. Popular 10k option as well. Mid April (usually sells out). Hampton Court Half Marathon | Fast, flat and visually interesting. Borders the riverside grounds of Hampton Court Palace. Good pre-London Marathon fitness test. Late February. 2500 entries. Richmond Half Marathon | Run on the roads and towpaths around Richmond, with 10k option. Late March. 3000 entries. North London Half | Starts and finishes in Allianz Stadium, running through Wembley Stadium and the leafy streets of north London. Mid-March. Ealing Half Marathon | West London half marathon launched in 2012. Late September. 5000 entries. Royal Borough of Kingston Half | Flat half marathon race in and around Kingston and out to Hampton Court Palace and back. Late September. Summer Breeze Wimbledon Running Festival | Includes half marathon, 10k, 50k and 12-hour races. Mid June. 600 entries total. River Thames Half Marathon | Flat, fast and scenic. From Walton-on-Thames to Hampton Court and back again following towpaths. Early October. Ranelagh Harriers Richmond Half Marathon | Flat and fast, early May half in Richmond that sells out in January. 1000 entries. Tunbridge Wells Half Marathon | Challenging but scenic and very popular. One hour southeast of central London. February. 3000 entries. Wokingham Half Marathon | This flat and fast half is just one hour west of London. Mid February. 2000+ entries. Bath Half | One of the UK's most popular half marathons, just over two hours west of London. Early March. 13,000 entries. Dartford Half Marathon | A largely rural half on the eastern outskirts of London. March. 400 entries. Fleet Half Marathon | Just an hour southwest of London this makes an ideal build up run to the London Marathon. Late March. 2500 entries. Hastings Half Marathon | Another great build up race to London Marathon, two hours southeast of London. Late March. 4000 entries. Maidenhead Half Marathon | One hour west of London this September half. 2000+ entries. Paddock Wood Half Marathon | Held in late March/early April just southeast of London. 2000 entries. Grand Union Canal Half Marathon | Point-to-point half along the banks of the canal in northwest London in early November. Down Tow, Up Flow Half Marathon | Another point-to-point race, this time along the Thames towpath (and it reverses direction each year) in July. 1,000 entries. Midsummer Munro | Trail half marathon with 3,000 feet of climb. Late June at Box Hill, just south of London. St Albans Half Marathon | Just north of the M25 (on the outskirts of Greater London) this June half attracts around 2000 entries. Also includes a 5k and a kids’ metric mile. Maidstone Half Marathon | A half held in October just southeast of London. 1000 entries. Windsor Half Marathon | Early October half that is just west of London. 4000 entries. Hurst Park Half Marathon | Starting and finishing in Walton-on-Thames (southwest London) on flat and fast roads and towpaths. Mid March. Run Reigate Half Marathon | Recent arrival in the autumn racing calendar, this scenic half marathon (with a 10k option) through iconic Surrey countryside, just south of London, is well attended and pretty quick too. Late September. 4000+ entries. Henley Half Marathon | One hour west of London this half follows the Thames River. Also includes a 10k. October. 1500 entries. 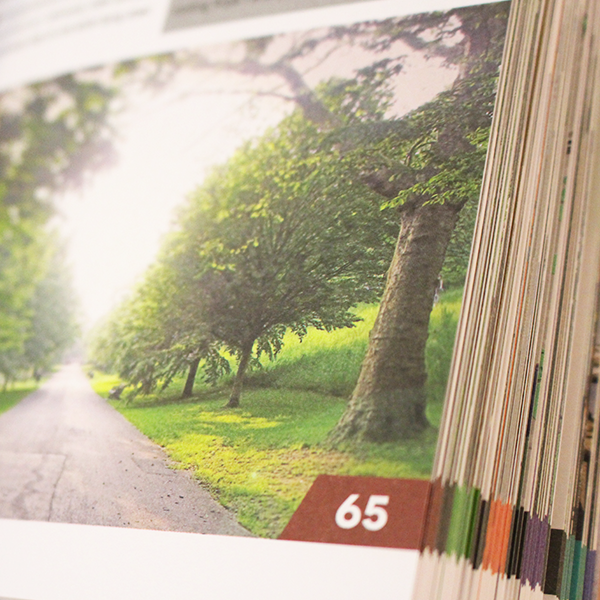 Reading Half Marathon﻿ | An extremely popular half just one hour west of London. Late March. 17,000 entries. Barns Green Half Marathon | Just over an hour south of London on quiet country lanes. Late October. 1500 entries. Water of Life Half Marathon | Scenic half (with 10k option) along the Thames near Marlow (just west of London). Late October. 1000 entries. Basingstoke Half Marathon | A young but popular race in Basingstoke. Early October. 1500 entries. Hastings Half Marathon | A popular pre-London Marathon half marathon, just under two hours southeast of London. Late March. 5000 entries. 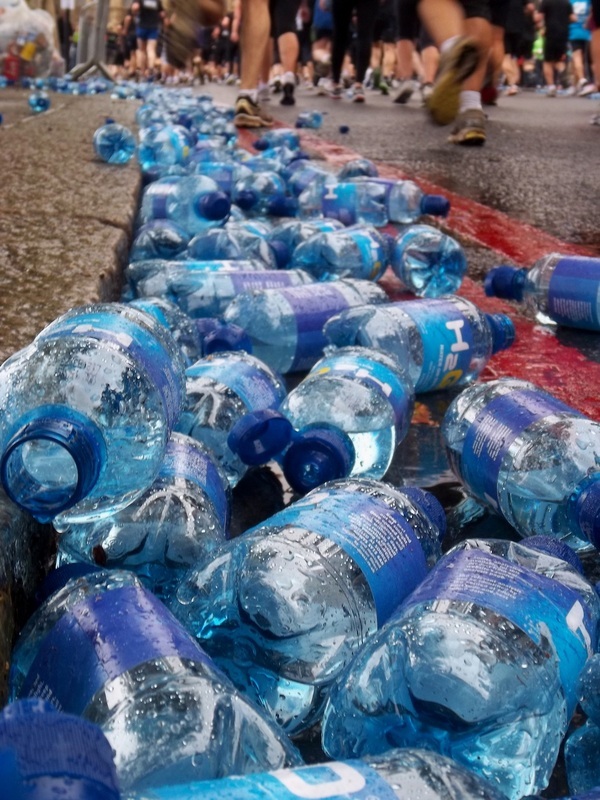 Thirsty work at the British 10k. The British 10k | A 10k road race around central London. usually in July. 20,000 entries (sells out early). London 10,000 | A 10k road race starting and finishing on The Mall, usually held in late May. About 12,000 starters (sells out early). Run to the Beat | Formerly a half marathon supported by music, they've scaled it back to a 10k finishing at Wembley Park. Mid September. 15,000 entries (sells out early). Croydon 10k | Annual race in south London, usually in October. 500+ entries. Regent's Park 10k | A late-autumn charity run (fundraising for After Adoption) on a flat course with great potential for quick times and all for a great cause. Late November. 1000+ entries. YMCA North London 10k and Fun Runs | Held annually in Crouch End in May. From Priory Park you'll run up and through Alexandra Park. 1000+ entries (plus kids events and fun runs). Run in the Dark | A global series of night runs (10k and 5k options) supporting paralysis research. The London race is held at Battersea Park in November. 1500+ entries. MoRun | Several 10k runs through London parks in November fundraising for Prostate Cancer (wear your mostache)—open for ladies as well. Knacker Cracker | 10k hilly trail race on New Year’s Day. Box Hill, just south of London. Richmond River Run | 10k annual race near Richmond in September. Regent’s Park Summer 10k Series | Held the first Sunday of each month at Regent’s Park. 500+ entries. Energized Sports 10k Series | Three 10k events held in November/December in Kingston, Richmond, and Wimbledon. 400+ entries. London Winter Run | A mass participation charity run (Cancer Research UK) along the banks of the Thames. 15,000 entries. Held in early February, Embankment (Central London). Santa Run | Fundraising for Starfish UK this is a popular 10k and 5k charity run where everyone is kitted out with Santa gear. Early December, Victoria Park. Parkrun | This is a worldwide movement of weekly Saturday morning 5k runs (not races as such, but social 5k time trials). It all started here in London, in Bushy Park, so while you’re here make sure you set aside Saturday morning to join in one of the 35 (and counting) Parkruns in London—there will be one near you. This is an essential London running experience. Free entry. Between 50 and 200 runners per event. Register online. Brooks Last Friday of the Month | 5k race in Hyde Park with an annual series based on age graded results. Organised by Serpentine Running Club. 200 entries. Great City Race | A corporate race over 5k around the closed streets of London’s square mile. Held on a week night in July, 5000 entries. Thames Path 100 | 100mi from Richmond to Oxford following the Thames. Sells out early. Early May, 200+ entries (must qualify with another ultra 50mi or more). North Downs Way 100 | 100mi trail race just south of London. Early Aug, 250 entries (must qualify with another ultra 50mi or more). The organisers also hold a 50mi race on the same course in mid-May. London 2 Brighton Challenge| 100k for the ultra-minded folk. Fundraising, non-competitive. May. Thames Path Challenge | Putney to Henley along the Thames for 100k (and 25 and 50k options). Fundraising, non-competitive. Mid-Sep.
Royal Parks Ultra | A 50k race from Hyde Park to Bushy Park, via the Thames Path and the off road trails of several other Royal Parks. October. 500 entries. 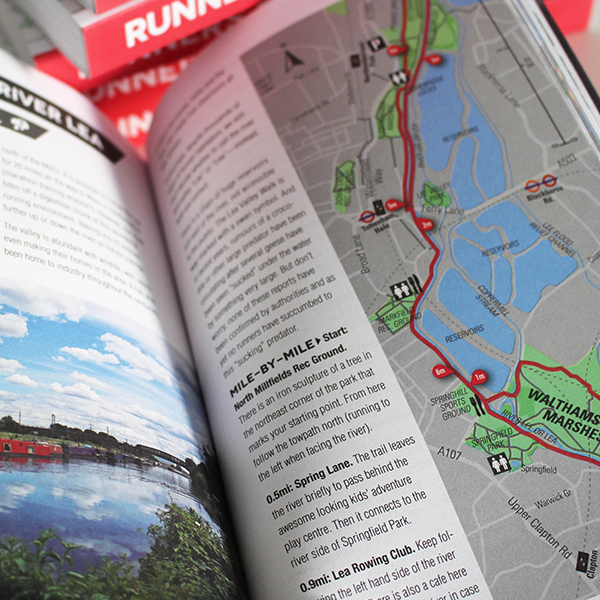 THE RUNNER'S GUIDE TO LONDON IS OUT NOW! 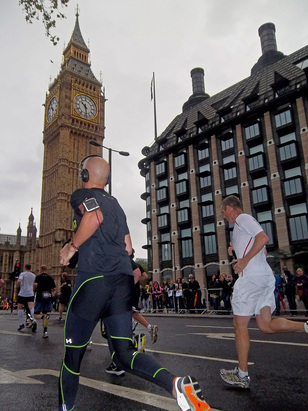 ​Westminster Mile | Mass participation mile race beginning and ending near Buckingham Palace in late May. City of London Mile | Another mass participation mile starting from St Paul's, running east to Bank of England and then finishing just past Guildhall. Free entry. Mid June. Run Richmond Park and Riverside | Regular 5 and 10k races. 500+ entries. The Cabbage Patch 10 Mile Race | Almost as old as the London Marathon, this race starts and finishes in Twickenham. Late October. 2000 entries (sells out). NOT HELD IN 2015. Finchley 20 | Long-running 20-mile race in March in northwest London. Ideal build up for London Marathon. 500+ entries. Kilomathon | Takes the traditional mile distances of 26.2 and 13.1 and switches them to kilometres to make a unique set of distances (and PBs!). Lee Valley in late Oct. 1000 entries. Clapham Common Series | Five races between March and October over distances 2k (kids), 5k, 10k and 15k. About 800 entries. Finsbury Park Series | Organised by the Clapham Common Series team, this currently has three races per year over distances 2k (kids), 5k, 10k and 15k. About 300 entries. Sri Chimnoy AC | Weekly races in the summer months over distances from 2 to 10 miles at Battersea Park (also hold an annual 24-hour race at Tooting Bec). 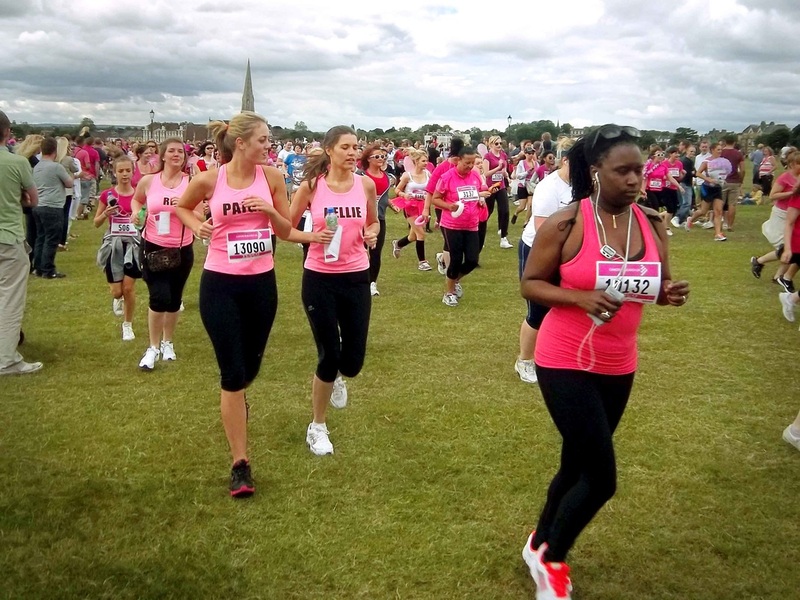 Race for Life, Cancer Research | Head to a London park in the summer and chances are you’ll stumble across hundreds, or even thousands, of women running in pink, raising money for Cancer Research. Distances are either 5 or 10k and more about social running, having fun and raising funds. Women only. Harry Hawkes 10 | A rare opportunity to race over the classic 10-mile distance, this race runs from Thames Ditton to Kingston and past Hampton Court on the way home. Late June. 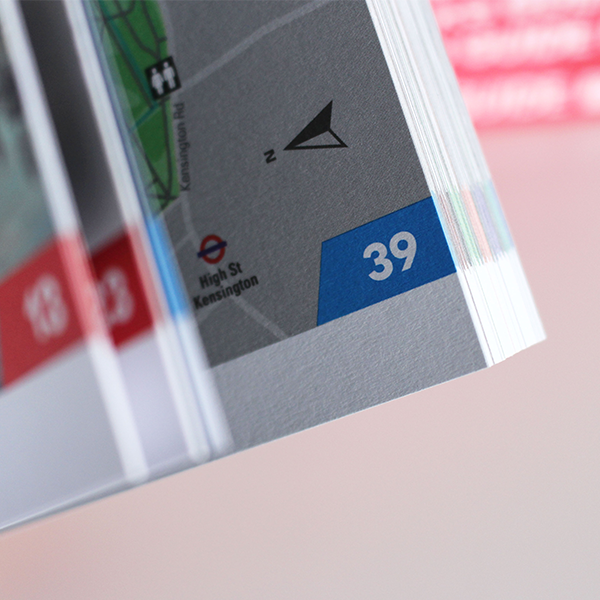 Ricky Road Run | A long-standing 10-mile race just near the M25 in Mill End, Rickmansworth. Late October. 500 entries. Tadworth 10 | Mixture of road and off-road 10-mile race. Early January. 800 entries. Paras 10 | 10-mile military style race/challenge at different locations and dates: Aldershot (Hampshire), Colchester (Essex) and Catterick (Catterick). Spitfire 20 & Tempest 10 | A 20-mile or 10-mile run on the Top Gear test track. Late March. 1000 entries total. Assembly League | A monthly summer road competition held in London parks over distances around 5k on the first Thursday of the month. Primarily for club affiliated athletes. Club Road Relays | No matter your level as a runner, you should definitely consider joining a London running club, of which the road relays are a must—team running at its very best. In October these are 6-men/4-women teams and in April 12-men/6-women teams.